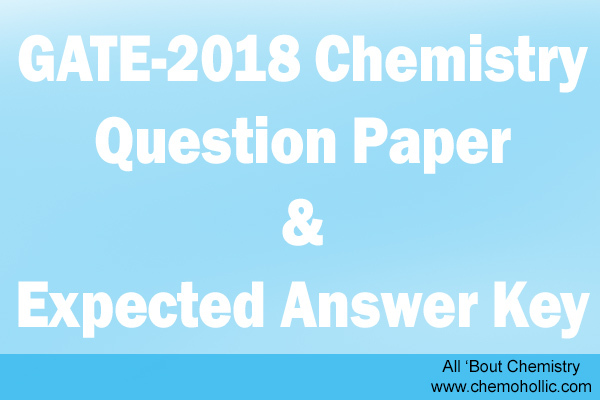 We are posting GATE 2018 Question Paper alongwith the Expected Answers in this post. GATE Exam consists of 10 General Aptitude Questions which are of 15 marks and 55 Chemistry Questions for rest 85 Marks, the total Exam is of 100 Marks and the time given is 180 minutes. 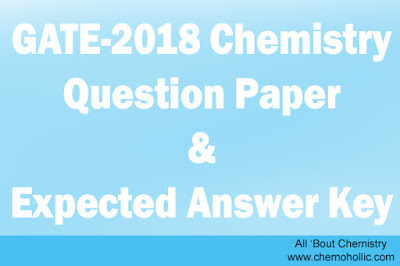 In the below post the complete Question Paper is attached, You can view and download it easily.This post will be helpful for those who didn't gave the Examination and for those who want to know the answers. NOTE: Due to lack of time, I am not providing answers for all Numerical Problems, I will be making a seperate video on HOW TO SOLVE NUMERICALS ASKED IN GATE 2018 Exam. The correct options for each questions is marked against every question. We are continuously trying to help and provide Question Papers, Study Materials, Assignments, Solved Papers and much more. We thank all our visitors for liking our posts and encouraging us to do more. Preparing for CSIR NET JUNE 2018??? Liked The Post...??? Don't Forget to Share with your friends.